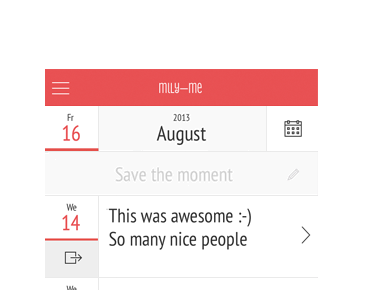 mlly.me is the „smallest social network” — it's a personal journal on your web server. Take a snapshot of your life and trace your personal chronic. You can capture a thought, describe a moment or feeling and save a photo. And you can share a moment with a loved one. mlly.me is based on the idea of writing a personal journal for people who care about personal data and web sustainability. This idea has matured and we just started developing, which unfortunately take some time. How can I use mlly.me? mlly.me is currently under development. You'll need to install the webapp on a dedicated web server or hosting services. We'll provide mlly.me via github as soon as we'll reach a stable version. 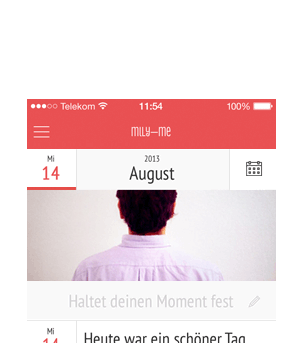 mlly.me is a webapp, you'll just use your web browser, e.g. Mobile Safari, Chrome, IE or Firefox. The webapp is based on common web standards like HTML5, CSS3, node.js, jQuery, PHP and sqlight3. The code syntax is written in Haml and Sass — for Codehipster. All your moments are stored on your web server. You or your provider are responsible for the security of the server environment. mlly.me shares no personal data to an external server or synchronizes the content to an external web service, that's for shure. 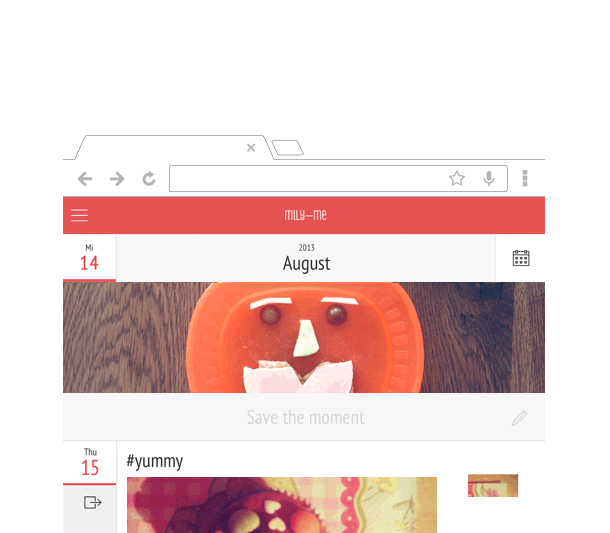 mlly.me is a private project under CC BY-NC-ND 3.0 and has currently no commercial objectives.